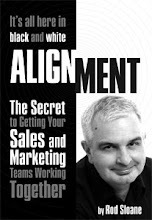 Sales and Marketing Alignment Blog from Rod Sloane: What is your twitter marketing strategy? Now, I’m pretty proud of this question, I bet it caught your attention. It’s also the dumbest question I could ask. It’s like asking what’s your postcard marketing strategy or your networking strategy. You see, twitter, postcards and networking are marketing tactics; their job is to help you achieve your goal/strategy. Your twitter marketing strategy should be the same as your overall marketing strategy, no difference or conflict. So what is your overall marketing strategy, how do you want to be thought of by prospect and clients? Now here’s how twitter can help and I would like to thank Andy Lopata for this pointer. Be nice to Andy, he supports Charlton! Andy suggests that we ask people who know us for the three adjectives that describe us from their point of view. Now, unfortunately lots won’t respond to this simple request. Maybe it’s too difficult or two personal, but I encourage you to ask. Hearing about how others see you is powerful. When you marry your strategy with how others see you, you are into something special and unique, the real you. Now go ask on twitter! 3 words I couldn't use about this blog. An extremely interesting post...must give it a try one day! Apologies about the deleted post above (note to self: always check profile information is up to date!!). One of my marketing strategies is to get so well known that if anybody mentioned the name Alice they immediately think of me! And for the right reasons, of course! I'm aiming to raise my reputation so that people start talking about what my business stands for even when I'm not in the room. It would be lovely to have people craving the Alice touch when it comes to design and marketing advice, just as BBC Radio Berkshire did this morning! Isn't it a good thing to have a positive attitude in business, especially during the credit crunch?